Members receive unlimited access for 4 months to ALL content within the In-Basket section. This unlimited access includes access to the videos titled; “Understanding Raters” and “In-Basket Exercises”. Members learn how the Fire Department In-Basket exercise is structured, how to manage it, and, most importantly, how to maximize their points. 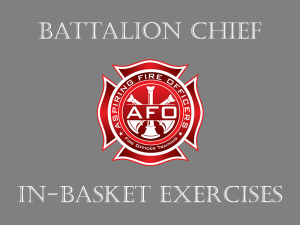 This section includes 4 high level Battalion Chief and 5 Fire Officer In-Basket exercises for members to complete. Each exercise has 10 items (total of 90 issues to manage) that will challenge our members’ knowledge of policies and procedures, general orders and departmental practices. Each scenario has a separate answer key that clearly explains how to prioritize each item and how to fully address it to maximize all available points. Finally, members can access dozens of additional downloads at no additional charge. Fire Department In-Basket Exercises have become increasingly popular in fire department assessment promotional examinations. There are many reasons for this. First, they are a reality of the Battalion Chief position. 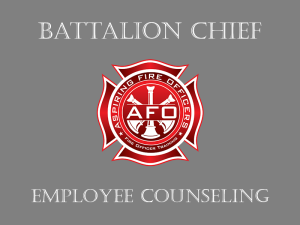 A Battalion Chief is faced with many administrative challenges throughout his or her day. The In-Basket exercise ensures that the candidate is prepared to assume the administrative responsibilities of the position. Secondly, Fire Department In-Basket exercises are easy to score. The exercise is pretty straight forward and either the candidate demonstrates proficiency in the event or he doesn’t. Scoring can be done at the leisure of the administering agency and does not require that the raters be present with the candidates. Our members learn how to succeed in the Fire Department In-Basket exercise by viewing the video titled In-Basket Exercise. Next they practice the 5 Fire Officer In-Basket exercises. When they have finished each respective exercise, they compare their answers to the ones that we have provided. This “practice” will provide a very good foundation for completing the 4 very high level Battalion Chief In-Basket exercises. Our members will learn how to prioritize each item in the proper order and ultimately how to manage each while earning the most points. Our members routinely find that our answers are much more complete than what they have produced. 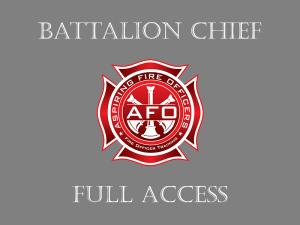 Members get to see our answers and learn the common themes of how to ensure they are maximizing their point value with every issue that is presented in the Fire Department In-Basket exercise.